The Shores: What a View ! We’re in the exceptionally scenic Village of Grosse Pointe Shores. The Shores is the smallest of the Pointes taking up 1.1 sq. 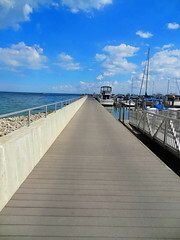 miles of land with gorgeous views of Lake St. Clair, making it a very attractive place to live. 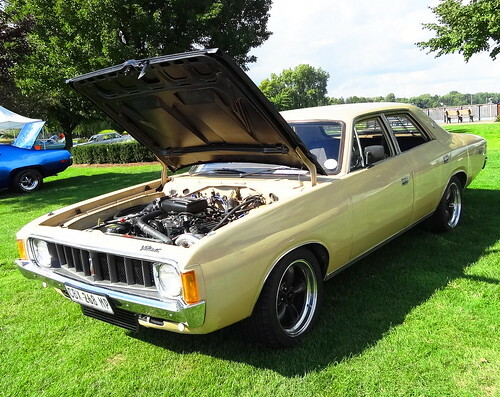 Friends have invited us to the residents-only Osius Municipal Park for a classic car show, the public is welcome. A rare opportunity to see something we normally couldn’t, let’s check it out. 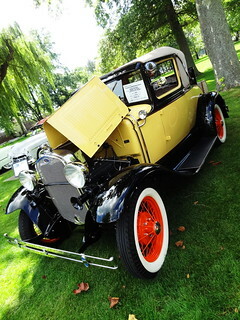 As we pass through the park gate and take in the scene; classic cars are parked single file, weeping willows hug the shoreline, stately boats fill slips in the marina, Lake St. Clair sparkles as if someone has thrown buckets of diamonds across its surface–what a beautiful location for a car show! We start at the point, towering trees provide shade for over-heated visitors, participants eat coney dogs on park picnic tables. Vintage Chrysler’s seem to outnumber every other brand; it’s only fitting since most of them were built a stone’s throw away in Detroit at Lynch Rd, Jefferson or Dodge Main in Hamtramck. 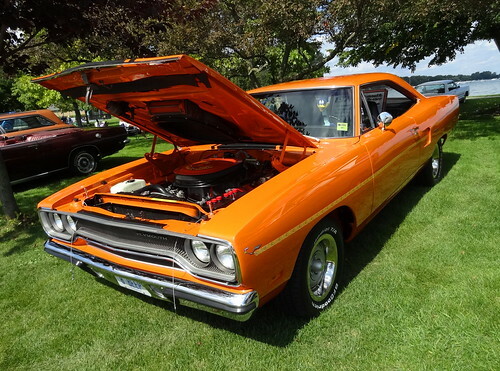 A trio of Roadrunners come in Vitamin C Orange with the Dust Trail stripe, the white one with a cool air-grabber hood is still wearing its Wayne State decal from its days as a test car and a silver sleeper with a blue interior powered by a monstrous Hemi engine; they all look great. 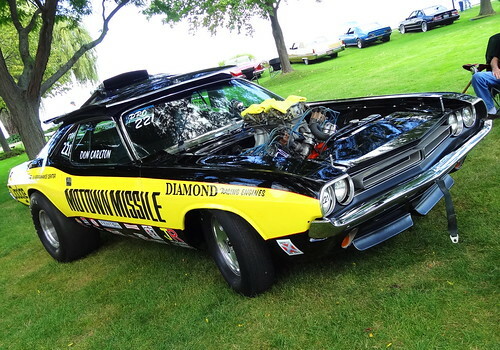 Motown Missile; it’s getting a fair share of attention. 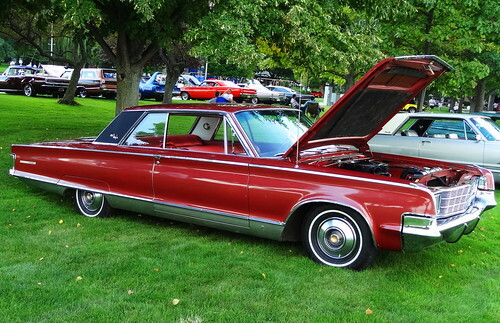 The 1965 New Yorker and 1967 Imperial (built at Jefferson) remind us what a luxury car really is. 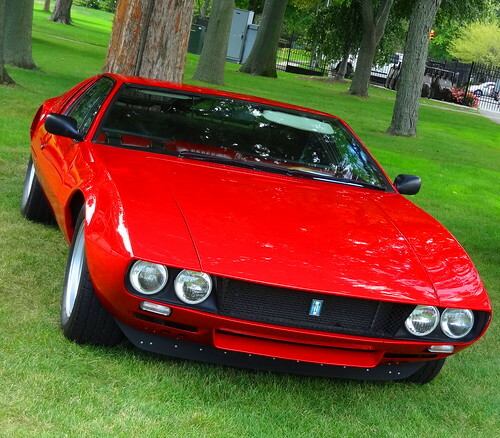 A bright red Mangusta sits low to the ground, this sleek Italian sports car is powered by a Ford drive train. 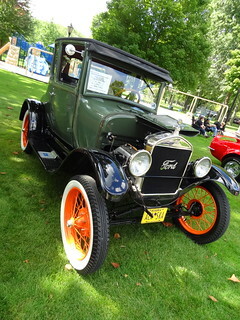 Speaking of Ford, a yellow Model A from 1930 and a green 1926 Model T represent the early era of cars. 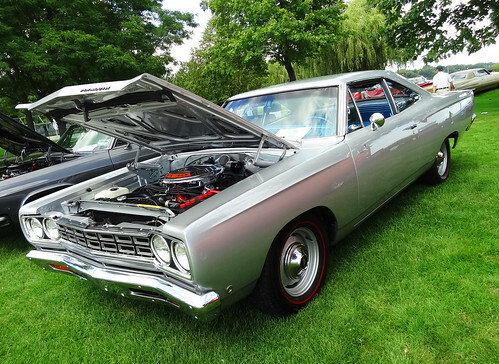 I take in red-line tires, raised white letters, racing stripes, hood scoops and vinyl tops, there are convertibles and a station wagon; the silver 1969 GTX looks awesome with a red interior. 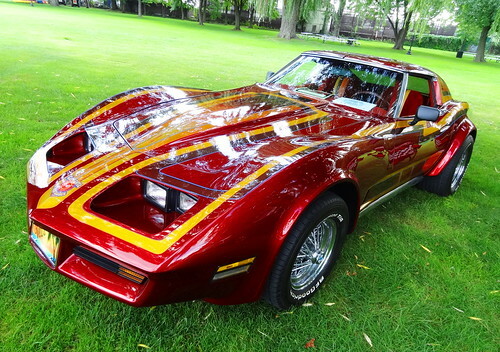 A deep red Corvette has a funky custom paint job–very 1970’s style with stripes in orange, yellow and blue, the interior even matches! 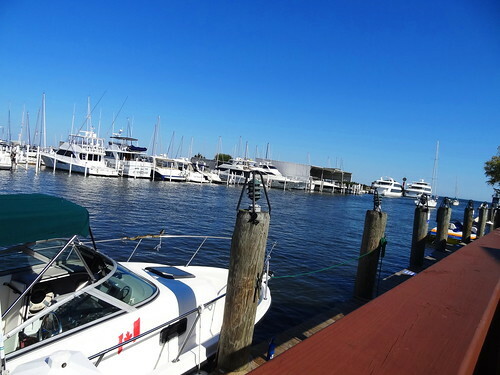 Our walk through the park leads us to the marina; a long dock takes us past fancy boats and elegant yachts. The warmth of the sun has built up during the day, a breeze coming off the lake refreshes us. On one side we see the backs of stately homes that reside on Lakeshore Dr, dozens of boats have dropped anchor just off shore while passengers take a swim or enjoy the view with a cold beverage. To our right a steady stream of boaters come and go from the marina, Scarab, Formula and Fountain are all represented, the Grosse Pointe Yacht Club can be seen in the distance. 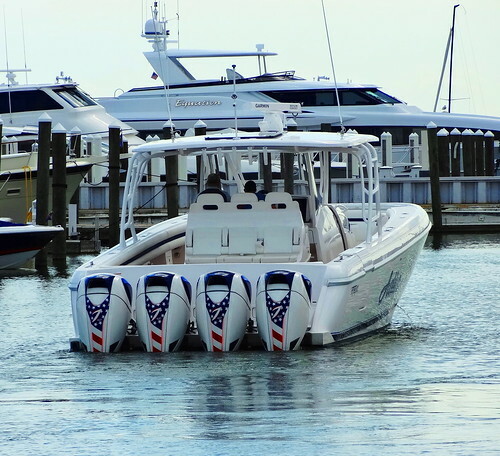 Suddenly our attention is focused on an Intrepid Center Console, as it makes its turn toward the open water we catch a glimpse of the quadruple motors with American flag decals; at 627 hp each these are the most powerful outboards made today–that’s one serious boat. Sitting on a bench we hang out a while longer, a freighter passes in the distance as more boats come out to play. We walk back through the park past scenic overlooks and take in the exceptional vehicles one last time before we go. 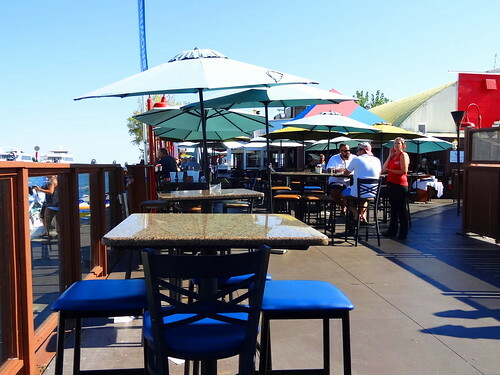 Here in Michigan we know how to appreciate beautiful days like today; one way is to dine al fresco with a commanding water view. 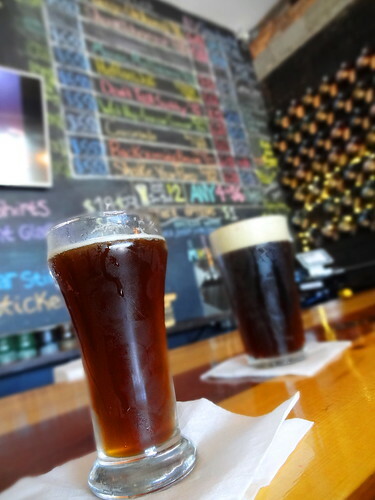 Brownie’s On The Lake, up the road on Jefferson provides just that. 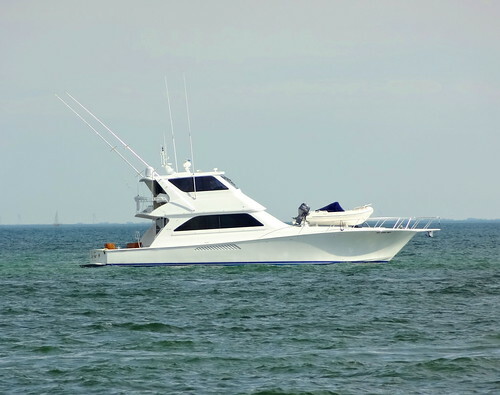 We take the long driveway all the way to the water, there is ample parking today. The restaurant itself is actually a vintage Quonset hut; today we’re eating outside. The large patio welcomes patrons, umbrellas shelter diners from the harsh sun. 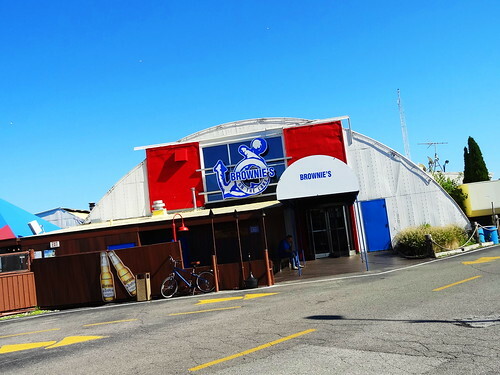 Servers hustle from table to table serving ice-cold beer, Bloody Mary’s, Fish and Chips and the famous Brownie Burger. We’re having the Rustica Flatbread; basil pesto, bacon, blue cheese, caramelized onions drizzled with a cherry balsamic reduction, a great combination of flavors. The sweet potato waffle fries are addicting, crispy outside, moist inside–yum! 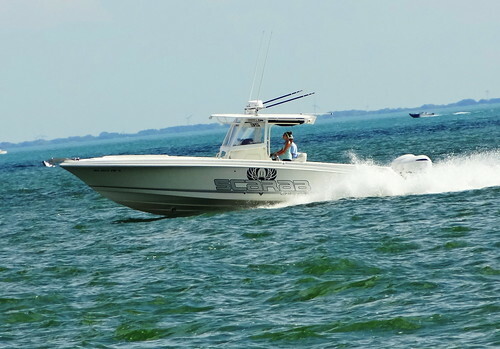 We take our time savoring the flavors and the scenery; boaters continue their trek to and from Lake St. Clair, you have to make the most of a day like today. When people are on vacation they seem to develop a certain sense of curiosity and adventure, they visit a museum or two, tour a mansion, they drive around a bit, see new things, maybe even try a new type of cuisine. I’d like to challenge you to take that same sense of adventure and do something you’ve never done right here in the metro Detroit area. Detroit is home to top museums, we have the second largest historic theatre district in the country, fine dining, art and culture. 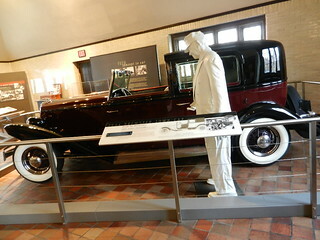 Men of wealth and power lived here, worked here, and changed the world from here, one of those men was Edsel Ford. 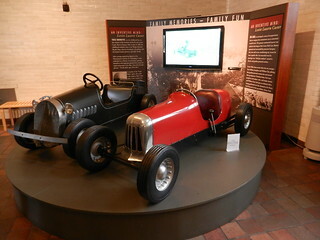 Edsel was the only child of Henry and Clara, he began working for his father at a young age and found the automobile business suited him perfectly. 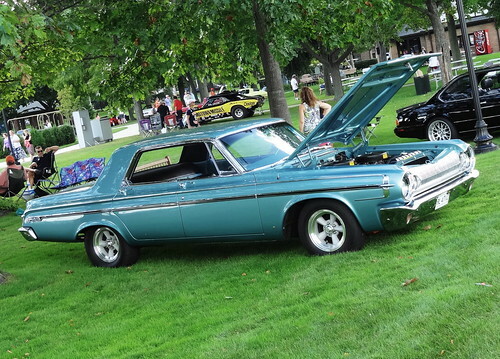 Edsel’s wife Eleanor lost her father at the age of twelve, it was then that her family moved in with her Uncle, J.L. Hudson. The fact that they came from affluent families paid a big part in their sense of appreciation for fine things. They were both known as extraordinary and generous, thanks to Eleanor their home is open to the public so we too can experience the beauty and elegance of the past. 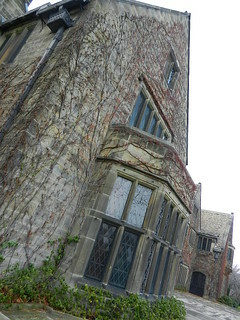 On an unseasonably warm November day we visited the Edsel and Eleanor Ford House on Lake Shore Drive. Construction on the home began in 1926, it took one year to build and two additional years to finish the interior. 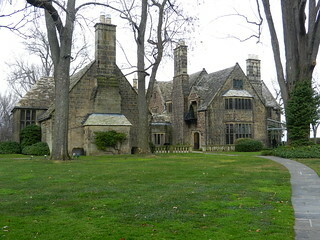 The home was designed by Albert Kahn; the Ford’s traveled with Kahn to England to choose the style of home they desired, there they decided on a Cotswold style home. 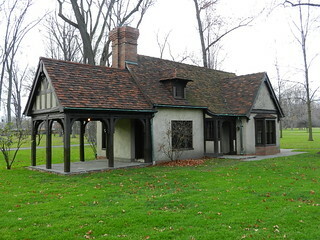 Paneling and fireplaces were purchased from manor homes across England, rooms were disassembled, shipped to Grosse Pointe, then the pieces were fitted into the home. 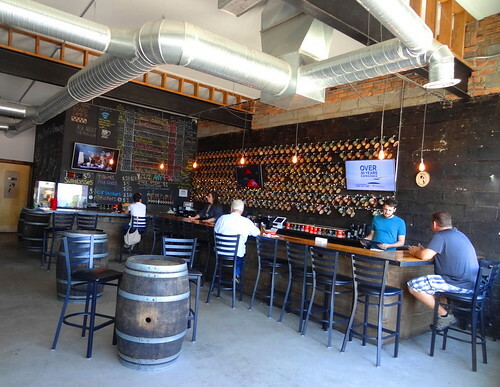 The exterior is sandstone, vines cover the walls, the roof is made up of hundreds of pieces of slate. 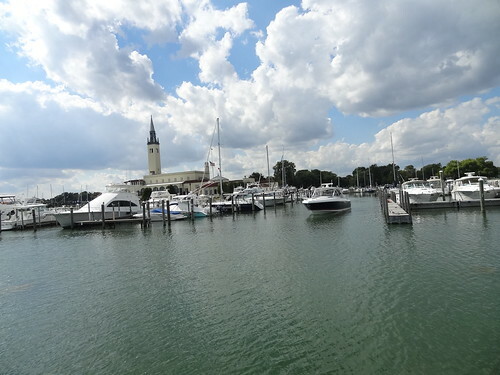 The home sits on 3,100 feet of Lake St Clair waterfront, the view is stunning! Enter through the front door into the main hall, the ceiling is low, it is plaster with a beautifully carved pattern, the walls are sandstone, it feels cozy. A gorgeous Christmas tree sits in front of a large stained glass window. It is an old fashioned tree, green and flocked as if there had just been a snowfall. Elongated ornaments hang from the limbs, these were custom made for Mrs Ford by Ford Motor Company. The tree is a replica of one of Eleanor’s favorites they had put up for a party years ago, the ornaments are the originals. One of my favorite things about visiting this home is that it looks the way it did when the family lived here. These are their furnishings, dishes, books, the things they used in their everyday life. It is thanks to Eleanor’s forethought that we can visit her home; she put the house in a trust so that it would be open to the public. She was devastated when the nearby Dodge mansion was demolished, and did not want her home to share that same fate. As you walk from room to room really look around, the paneling is 16th century oak, the carvings are finely detailed, the linen fold amazes me. 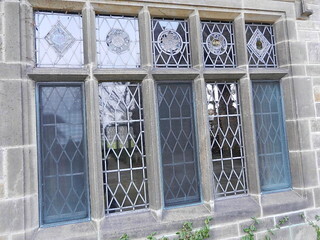 The stained glass windows are 14th century, fireplaces are centuries old. The Gallery is the largest room in the home, measuring 25 x 60 feet this is where the family held large gatherings. Here you’ll find another carved plaster ceiling, English paneling and a huge Gothic chimney piece. 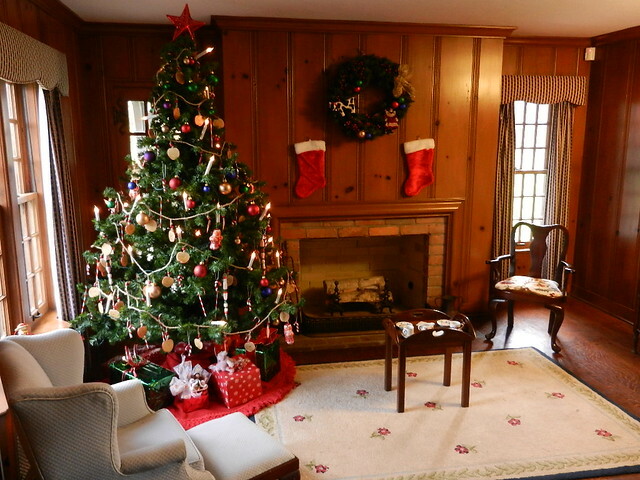 This is a great time of year to visit, the house is decked out for the holidays, the Christmas trees are lovely and many of the ornaments are original. The Fords had purchased many paintings from significant artists, the ones that were donated to the DIA or were taken by the children have been replaced by reproductions, some originals still hang. Yes, the house is huge, but each room has it’s own feel, the rooms are decorated and arranged in such a way that they feel welcoming and comfortable. I think I like the dining room the most; furnished in dark Pine from a 1740 home in England, it is lit only by sunlight during the day and candelight and the glow of the fireplace in the evening, it is a spectacular room. The table is set for a holiday meal with Mrs Fords china; an elaborate lace tablecloth covers the wooden table, delicate stemware awaits the evening’s wine. Like many homes, they also had a children’s table, this one sits in front of the window overlooking the grounds. The Fords raised four children here, the youngest William was only four when they moved in. 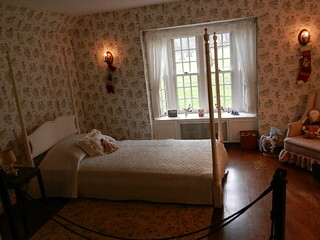 Their bedrooms were redone as guest rooms after the children moved away, other rooms were updated as well. The modern room is a great example of Art Deco; done in the 1930’s it is still stylish by today’s standards. Everything for this room was custom made, much of it is built-in and bolted to the floor. The Steinway piano is custom made and one of a kind. If you like ultra modern style be sure and check out Henry’s bathroom; the walls are a grey glass called Vitrolite, it’s really cool. As you may have noticed by now, photos are not allowed inside the home. You are allowed to photograph outdoors and inside the garage, which is where we are heading next. The home rests on 87 acres of land, on the property is the main house, gate house, power house, pool house, garage and the playhouse. If you can, walk around a bit outside, the exterior detail on the house is exquisite; simple things like downspouts and brackets are detailed and elegant. If you’re lucky you may catch a glimpse of a passing freighter. 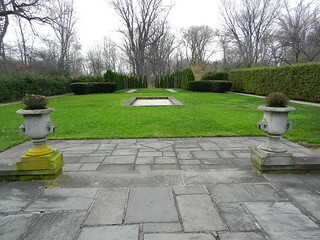 The grounds were landscaped by Jens Jenson, he also designed the grounds at Henry and Clara’s home in Dearborn. The man made lagoon once opened out onto the lake, but was closed off for the family’s privacy. Be sure and see Josephine’s playhouse; it was a gift to her from grandma Clara in 1930. It is adorable; everything is scaled down to perfectly fit a little girl, it even has electricity and plumbing! Walk a little further to the garage; it was built to hold eight cars, and there’s a turntable so you never have to back out of the garage. 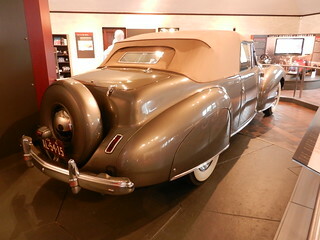 One of the most impressive vehicles is the 1941 Lincoln Continental Cabriolet, which was designed by Edsel himself, Frank Lloyd Wright called it the “most beautiful car in the world”. It is still one of the most highly thought of designs of all time. 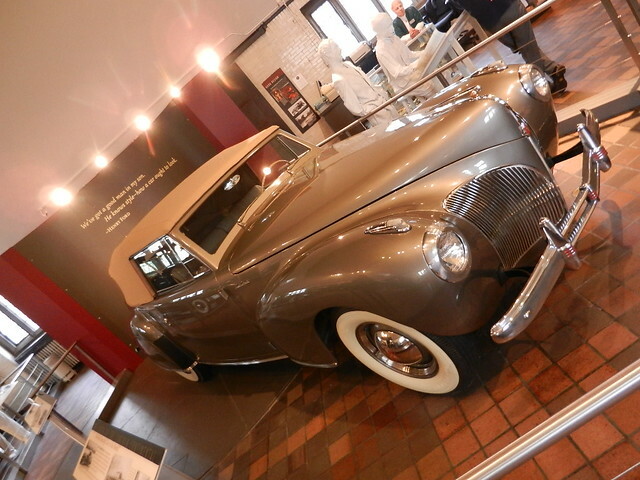 The Cabriolet, 1934 Brewster Town Car and the 1938 Lincoln Brougham were all owned by the Ford’s. Check out the kids go-karts. People from all over the world visit the Ford house, come see it for yourself. 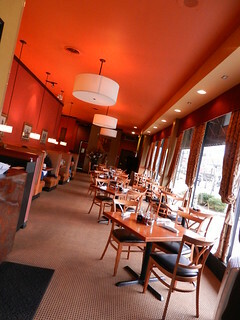 For lunch we drove to the area of Grosse Pointe known as “The Village”. On the corner of Kercheval and St Clair is a little restaurant called TN Thai. 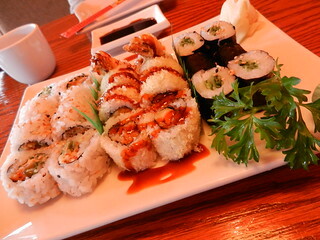 They have a great selection of sushi on the menu, 35 different sushi rolls alone! We have not had their Thai as of yet, but every plate that went by looked appetizing. 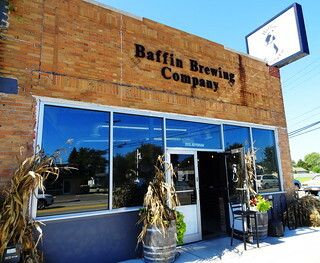 In the warmer months we like to sit out on the patio, but those days are gone now. We like to start with their Fresh Rolls, these are some of the best we’ve ever had; rolled tight and packed with delicious fillings like tofu, bean sprouts, noodles and cilantro. They serve a cup of soup with all meals, broth based, with bits of cilantro, it’s really good. We’ve never been disappointed with their sushi, and we’ve tried many varieties, today’s was no exception. I love the Jasmine tea either hot or iced, Kris prefers the raspberry iced tea, either way, you can’t go wrong.